Usher an artistic flourish into your home decor with this beautiful counter stool. 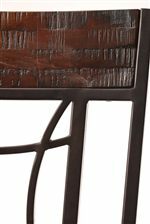 The piece carries a dark chestnut finish and features a rectangular, bamboo-inspired back as well as elegant metal arches. In addition, the antique russet vinyl seat cover adds a sense of richness to the overall look while the 360 degree swivel brings function. Create a distinguished look in your home with this counter stool. The Granada Swivel Counter Stool w/ Upholstered Seat by Hillsdale at A1 Furniture & Mattress in the Madison, WI area. Product availability may vary. Contact us for the most current availability on this product. Create a dining or living room setting with a dash of artistic flourish and distinguished flair by adding the Granada collection to the decor. The pieces carry a dark chestnut finish and feature square bamboo-inspired hardwood tops as well as elegantly arched metal legs. Meanwhile, the matching side chairs and stools include a rectangular, bamboo-inspired backs and antique russet vinyl seat cover, which add a sense of richness. In addition, the stool's seat come with a 360 degree swivel while the cocktail table's expands, creating more room for friends and family to gather. With the perfect blend of simplicity and sophistication, the Granada collection will make your home handsome and timeless. The Granada collection is a great option if you are looking for Transitional furniture in the Madison, WI area. Browse other items in the Granada collection from A1 Furniture & Mattress in the Madison, WI area.